The 'golden age' of Japanese screen painting occurred in the 1600s in Kyoto, when these brilliantly realised screens were painted by Kano Eino, third generation head of the Kyoto Kano school. The style had emerged in the confidently flamboyant Momoyama period (1568-1615) as the brash and newly emergent samurai elite sought an ostentatious display of their own power and wealth. It was their patronage that created for the first time lavish screens of gold background decorated with symbols of power such as bamboo and cypress. The new style, expressed most beautifully by artists of the Kano school in the late 1500s and 1600s, was an intuitive distillation of the dialectic that has driven Japanese culture: its accepting/rejecting relationship with China. The dialectic (which the Japanese call 'wakan', 'China/Japan') was based on a series of opposites: monochrome/colour, emotion/restraint, abstraction/nationalism. 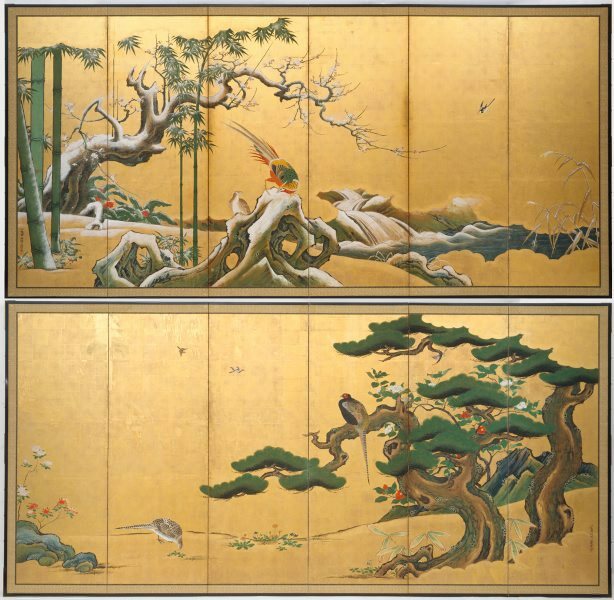 The dialectic is epitomised in these screens: the bold, vigorous and rich brushstrokes of Chinese painting displayed in the rhythmic sweep of the lichen-covered cypress trunks and the sharp lines of the rock faces, combined with the clear, bright colours and attentive recording of nature that is the native inheritance of the Japanese artist. The delicate, elegant handling of the dandelions and lilies on the top screen exemplifies the native Japanese sensitivity to nature. The screens also realise this dialectic symbolically: the cypress was a favoured symbol of the samurai to express their dominance and power, while the pierced rock formation on the bottom screen is a classic Chinese Daoist interpretation of the 'yin' and 'yang', void and form. The pampas grass with its trimming of autumnal frost (in reality a movingly beautiful sight) is a favourite Japanese subject for painters and poets. The combination of the pine, bamboo and plum blossom on the extreme left originated in 13th century China and became one of the most popular depictions of Chinese art. Termed the 'Three Friends of the Cold Season', the trio is laden with symbolism: the pine exemplifies steadfastness and courage, the bamboo uprightness and the plum blossom, purity. The pheasant, often synonymous with the phoenix, is a Chinese emblem of beauty and good fortune, while in Japan the pheasant was the prey in the samurai's beloved sport of falconry. The strong interest in plants such as camellias that arose in the mid 1600s is also reflected in this work. The Asian Collections, AGNSW, 2003, pg.218. Art Gallery of New South Wales: highlights from the collection , Sydney, 2008, 176 (colour illus. ), 177 (colour illus.). The colour illus. on page 177 is a detail of this work. Art Gallery of New South Wales Foundation Annual Report 1997 , Sydney, 1997, cover (colour illus. ), 20 (colour illus.). Bruce James, Art Gallery of New South Wales handbook , 'Asian Collection: East Asia', pg. 246-287, Sydney, 1999, 273 (colour illus.). The Asian Collections Art Gallery of New South Wales , 'The World of Samurai Culture', Sydney, 2003, 218, 219 (colour illus.). Michael Wardell, Look , 'Foundation building', pg.14-17, Sydney, Sep 2004, 17.